Effective health management is a shared responsibility that requires a coordinated approach from all countries, particularly with regards to emergent pathogens such as “EMS” (acute hepatopancreatic necrosis disease of shrimp), where containment requires a rapid response from the international community. There are good reasons to believe that wide and increasing inbreeding is also a significant factor in the epidemics frequently observed in the aquaculture industry. A special session on Regional Cooperation for Improved Biosecurity was held at the World Aquaculture Adelaide 2014 conference, from 7-11 June. The session discussed i) regional cooperation in biosecurity, ii) dealing with emerging diseases, focussing on acute hepatopancreatic necrosis disease, and iii) domestication programmes and their implications for genetic diversity, disease susceptibility and resistance. NACA would like to thank the Australian Centre for International Agricultural Research for providing a travel grant that allowed the speakers to attend the conference. Brett Herbert introduces the special session with a presentation on biosecurity and regional cooperation. Transboundary aquatic animal diseases are one of the major concerns for strengthening of aquatic animal health management capacity in the region. 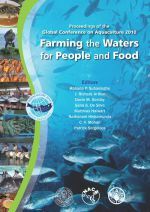 The spread of these diseases demonstrates the vulnerability of the aquaculture industry, as well as the wild fish populations, to disease emergence where impacts have been exacerbated by the lack of preparedness. NACA's Aquatic Animal Health Programme, established in 1998, provides a mechanism for regional governments to coordinate disease preparedness, surveillance and response. In early 2013, Vibrio parahaemolyticus was discovered as the causative agent of acute hepatopancreatic necrosis disease (AHPND). Subjecting 4 arbitrarily selected V. parahaemolyticus isolates obtained from a single farm in November 2012 to the previously reported immersion challenge protocol, we confirmed that 3 caused high mortality at different rates accompanied by characteristic lesions of AHPND while 1 caused high mortality without such lesions. Virulence may be determined by mobile genetic elements such as plasmids or bacteriophages. The emergence and spread of new or previously unknown infectious diseases has had very significant impacts on public health, food security and international trade. Disease emergence is the consequence of environmental and/or sociological changes that disrupt the ecological relationship between pathogens and their natural hosts. Understanding the drivers of disease emergence will help us develop policies and practices that will reduce opportunities for disease emergence in aquaculture and improve prospects of containment.